The origin of Hug Your Cat is unknown, which is quite common for unofficial fun holidays. But do you really need justification to give a hug to your furry friend? Go ahead and give your cat a big squeeze! If your cat is a cuddler, consider yourself lucky. You can curl up on your couch, cuddling with your cat. In case your pet is not fond of hugs, make it quick and beware of claws. Not only is cuddling with cats pleasant, it is also believed to be beneficial for human health. Cats are thought to be able to improve the psychological state of their owners by alleviating negative moods. According to studies, cat purring helps reduce stress levels and makes us feel calmer, which is good for our cardiovascular system. 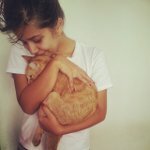 If you don't have your own cat to hug, ask a friend who owns a cat to lend you their pet for some much needed cuddling. We are sure they won't deny you! Or you can adopt a cat from a local shelter and hug your new pet as much as you want. If you are allergic to cats, you can at least watch cute cat videos on YouTube or cat gifs on Tumlbr.